It was going to be a glorious new beginning: turning a corner in parenting, relationships, and commitment to health. I’d registered with a friend to run the Labor Day Virginia Beach Rock & Roll Half-Marathon. Our husbands would watch our born-a-day-apart sons, who we hoped by 17 months would both be sleeping through the night and walking (though preferably not at the same time). It would be my first run over 10 miles, our first time to the beach since moving to the East Coast, and our first vacation with friends. Then, two weeks before the race, I fell bending over to pick up a roll of paper towel, barely avoiding my son’s head crashing onto the sidewalk and decidedly not avoiding a nasty ankle sprain. We canceled the thousand-dollar three-night-minimum hotel reservations, and I sulked over my self-sabotage for a few weeks while the ankle continued to swell. Eventually, I made emotional and physical progress (the latter helped mostly by something I’d never heard of, Muscle Activation Technique, or MAT), and by the spring I was running again. I heard about a new half-marathon organized to support women runners. When I looked up the Zooma Annapolis race and read about post-race pampering, the event sounded too frou-frou, “something you’d do with a girlfriend,” my sister-in-law said. But when my MAT practitioner not only gave me the all-clear to train but also said, “So what?” to my hesitation over the event’s girliness, I decided to register for the June 1st race. What surprised me during the race was that my mommy identity and my running identity finally felt compatible. I’d always felt a little guilty going out to run or do yoga, even though I knew that taking care of my body made me a healthier, happier mama. No matter how good it was for my family, training still took up a lot of time. Well, I was in good company in the Zooma race full of mothers. On the wooded Baltimore-Annapolis trail, women were chatting about babysitting, school, breastfeeding. Children in strollers with papas lined the open sections of the route. I felt so excited to have these identities of mother and runner no longer in opposition to each other, when I got to the after-race Expo and saw the Mommy Goddess booth selling t-shirts, I bought two. But that was June. I didn’t keep up a training pace in the summer. I hadn’t run more than five miles since the half-marathon when, in late September, I ran about 8.5 with a friend who was training for the Army 10-Miler eleven months after the birth of her second son. Having myself always been a solo runner – never confident enough to become a member of See Mommy Run – I was nervous to run with this one-time-near-Olympian who’d already been inducted into her college’s athletic hall of fame. So it was a boost to my ego to hear her say we were going faster than she was used to. The next day in toddler gymnastics, I enjoyed my goofy little warm-up with my son, stretching happily-used muscles. Then, just a few Mondays later, somehow the slow jog around the bouncy floor and the over exaggerated-modeling lunges became all I could handle. I’d gotten ridiculously out of shape in record time, goddess no more. I didn’t like being more out of breath than two- and three-year-olds. Come to think of it, I also didn’t like the added pudge and the loss of my lean legs. That October day, as I held my son’s hand on the balance beam, I resolved to put down on these very pixelated pages my Running Goals for Spring 2009 : to do the National Half-Marathon in March and the Cherry Blossom 10-Miler and the George Washington Parkway Classic 10-Miler in April. And I would look for a nearby marathon in May or June. Okay, so now it’s January, the mother of all goal-setting months. I did at least find out that Frederick, MD has a marathon on May 3 and Wilmington, Delaware has a one on May 17. But I missed the registration for the Cherry Blossom and haven’t done anything about the others yet. And it’s taken me over three months to finally commit these words to cyber-reality. I swing back and forth, taking off neither in the direction of sloth nor of athleticism. It hasn’t helped that every time I’ve run this fall and winter, it’s either cloudy or else it seems like the sun has started to set by about 1:00 p.m. Where’s the Vitamin D? It seems like you have to get out only after 10 a.m. and before noon these days in order to catch any serious solar power. I swear, Global Darkening is real, and it’s scary. I keep having to drag out the SAD light of yesteryear (but only when my son is out of the house, and then I promptly move it back to the basement before he destroys it). So it was a nice change of pace this weekend when my husband took our boy to the grocery store and I enjoyed an easy seven-mile run that started at the still-sunny hour of 11:00. I caught rays and got excited about the idea of my husband and son taking a Saturday morning class together this winter. Then I can be sure to have one longer-than-the-gym’s-childcare-will-take-my-kid workout a week. Somehow the knowledge of that regular time makes a difference. Toddler hugs are much sweeter after sweat. I have yet to click a “Register Now” button, but I’m inching closer. One step at a time. Good for you and good luck!! i did my first half marathon in 2008, i had to stop training for 2 weeks b/c of an injury = i was obsessed with doing it and i did and i was so happy. if i don’t have a race planned i get lax and NEVER get to the gym. i hate. i have been sick for 3 weeks and have done nothing. you should check out runumother – great shirts for moms to run in. Oh, I can so relate to the freedom of running, especially child-free! 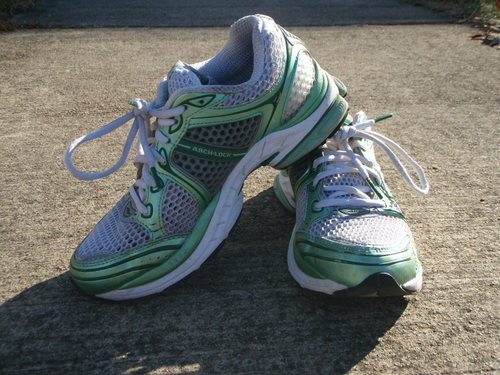 I’m still nursing an injury that has kept me sidelined for months and am hoping that ’09 will be my year to run again. Good luck, Jessica. And good for you for putting your goals in print; I find that it always helps me to achieve my goals (or at least come closer to achieving them) when I’ve written them down and/or shared them with people. Keep us posted on your progress!